The Happiest Sound In All The World! Share the magical, heartwarming true-story that has become the most popular family film of all time - Rodgers and Hammerstein's The Sound of Music. Julie Andrews lights up the screen as Maria, the spirited young woman who leaves the convent to become governess to the seven children of Captain von Trapp, an autocratic widower whose strict household rules leave no room for music or merriment. Winner of five Academy Awards, including Best Picture, this timeless classic features some of the world's best-loved songs. That said, I have to admit I enjoyed 1965’s The Sound of Music. I thought it made for a reasonably entertaining viewing. The film reworks the Rodgers and Hammerstein stage production for the screen, and that work actually adapted the story of the von Trapp family from its factual origins. As with most musicals, the plot can be summed up easily: flighty proto nun Maria (Julie Andrews) is assigned to be the governess of seven difficult-to-handle children. A retired naval captain named Georg von Trapp (Christopher Plummer) heads the family and maintains a stiff distance from his kids as he runs the household with military precision and discipline. Inevitably, free-spirited Maria stirs the pot and makes massive changes in the family. Also inevitable romantic complications ensue, and the whole crew becomes a nice little unit complicated only by those pesky Nazis. The film contains maybe an hour's worth of actual story, but the songs pad it out to nearly three times that length. Whether or not this is a good thing depends on your interest in showtunes. Since I don't like them, they make the experience more difficult to tolerate. However, obviously others feel differently, and many will like the picture that much more due to the presence of the musical numbers. When I put on my "objective hat", I can see that Music is definitely a very well executed film. Director Robert Wise paces it nicely and keeps the action moving. Although the plot isn't exactly complex, it easily outdoes trifles like Gigi or An American In Paris, films in which the stories are nothing more than excuses for song and dance numbers. At least Music presents a real narrative, and though character development stays pretty minimal, it exists and the film moves along smoothly. The presence of a strong cast helped. Julie Andrews embellished her "goody-goody" persona her as Maria, but she creates a pretty well realized character and she works well in front of the camera. Plummer was a nice addition to the group, as he easily communicates both the gruffness of von Trapp but he also offers a nice transition in to the kinder, gentler captain when necessary. All of the kids seem solid. The danger of excessive cuteness seems ever present, but the film rarely falls into that (von) trap, even when we encounter little Gretl, the youngest of the seven. In many ways, Music often flirts with sickly-sweet qualities but it somehow manages to stay fairly palatable. Add to this some gorgeous cinematography - shot in the native European territory - and even with my bias against musicals, it's pretty easy to see why The Sound Of Music has remained such a beloved film for so many years. Personally, it didn't do much for me, but I still think it's a solid piece of work that holds up nicely after 40 years. 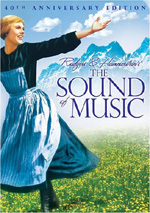 The Sound Of Music appears in an aspect ratio of approximately 2.20:1 on this single-sided, double-layered DVD; the image has been enhanced for 16X9 televisions. An improvement over the DVD released in 2000, this one looked quite good. The old transfer mainly suffered from edge enhancement. Haloes popped up quite a lot in that image. Happily, those didn’t reappear for the new presentation, as it seemed free from that problem. Sharpness was generally strong. Some scenes looked a little soft, but I felt most of that stemmed from lighting and photographic choices. In particular, “moonlight” shots tended to be softer than the rest of the movie. Overall, the flick looked concise and well-defined. Moiré effects and jagged edges seemed non-existent while print flaws appeared very insignificant. I noticed a few isolated examples of speckles and grit. However, for such an old movie, the number of defects seemed extremely low. Colors were pretty and accurate. Most scenes rendered the hues in natural and adequately saturated tones, though some variations occur. Flesh tones occasionally looked a little overly pink, but those parts were exceptions, and most of the movie presented attractive colors. Black levels always appeared dead-on, as they seemed very deep and rich, with virtually no signs of fading. Contrast was also strong, and low-light situations were reproduced cleanly and smoothly. I flip-flopped between a “B+” and an “A-“ but I went with the higher grade due to the overall attractiveness of the image and because of its age. Music certainly didn’t look 40 years old. Whereas the old DVD offered a Dolby Digital 4.1 mix, the 2005 Sound of Music went with a Dolby Digital 5.0 track. Why did it lose the dedicated LFE channel? I don’t know, but I didn’t miss it, as the mix still offered sufficient low-end. Despite the change in channel definition, it also sounded a lot like the prior soundtrack. The soundfield was heavily biased toward the front channels. In that spectrum, the audio spread quite broadly across the three forward speakers, as the sides participated actively in the production. From music to effects to dialogue, the left and right speakers had almost as much to do as the center. I found this to work well and to create a vivid sense of place, though I thought it oriented too much to the left. Especially in comparison with the active front speakers, the rears had little to do. They provided some light reinforcement of the forward channels and that's about it. I think they became a little more active during the thunderstorm, but even then, the mix remained biased toward the front. Audio quality seemed good for its age. Dialogue usually sounded clear and easily intelligible. The lines displayed some mild stiffness at times but always were understandable and relatively strong. Effects seemed acceptably accurate and crisp, with adequate range. Music appeared fairly lush and lively. Dynamics were more than acceptable for a 40-year-old mix. Ultimately the soundtrack of Music was more than satisfying. When we dig into the extras on this two-disc set, we start on DVD One with an audio commentary/semi-isolated score. Also found on the prior DVD, this piece combines remarks from director Robert Wise with long passages of music. The songs have had the lyrics removed so listeners can focus on the backing track itself. Wise speaks on top of some of the music, but most of it plays without interruption. Actually, I believe that the only parts marred by speech are those that appear cleanly in the film anyway, so I don't think Wise's comments hurt the isolated music. Even if his statements do cover some tunes, they're worth the interruption. Wise fills almost all non-musical segments with very interesting and informative comments. He covers a wide variety of topics, but most compellingly discusses changes made from the historical story and from the stage production. He also divulges nice details about casting and other decisions. All in all, it's a fine commentary that added a lot to my enjoyment of the film. 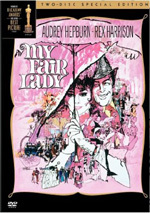 Another audio commentary comes from actors Julie Andrews, Christopher Plummer and Charmian Carr, choreographer Dee Dee Wood, and Johannes von Trapp. Each was recorded separately for this piece. With so many participants, you’d think they’d be able to easily fill the length of the movie, even for a long flick like Music. Unfortunately, that’s not the case, as lots and lots of dead air occurs along the way. I’d not be surprised to learn that there’s more than 30 minutes of information here. That’s too bad, for when the participants speak, they offer quality remarks. The track lacks much happy talk and can actually be pretty bitchy at times – in a good-natured way, that is. Andrews starts out with complaints about problems during the opening sequence, and Plummer tosses in gripes about challenges related to working with kids, playing guitar, and other areas. We also get notes about devising and executing musical scenes, acting challenges, the reality behind the story, locations and other production issues. Again, I like the information we hear; I just wish we got comments on a more consistent basis. The disc opens with an introduction from Andrews. During this two-minute and 10-second chat, she discusses the movie’s enduring popularity and relates what a special DVD this will be. I think intros like this are fairly useless, but they’re also harmless, I suppose. For fans of the movie’s music, a couple of options appear. We can Sing-Along with the flick’s songs via a subtitle track. This lights up the lyrics as they appear on screen. Oddly, the “Sing-Along” omits “Marie” and “Climb Ev’ry Mountain” for the French presentation. We also get a chapter option for the Songs Only. This will allow you to jump to any of the film’s 24 performances. 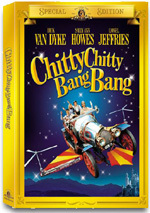 Moving to DVD Two, we begin with another introduction from Julie Andrews. During her 107-second chat, she gives us an overview on what to expect from this platter. From there we head to My Favorite Things: Julie Andrews Remembers. In this 63-minute and 16-second program, we hear from Andrews as well as Carr, Plummer, Wise, Wood, Johannes von Trapp, Rodgers and Hammerstein Organization president Ted Chapin, writer Russel Crouse’s widow Anna, and composer Andrew Lloyd Webber. The program covers a mix of topics. They discuss the real Maria von Trapp and her attitude toward the production, approaches to characters, factual details and liberties, other versions of the von Trapp story, and experiences with Rodgers and Hammerstein. From there we go through the development of Sound, facets of its music, adapting the stage show for the big screen and the contributions of writer Ernest Lehman, choreography and staging aspects of the film, Wise’s impact on the production, the performances and Plummer’s relationship with the kids, problems with rain during the shoot, rehearsals and general anecdotes from the set. First a complaint: what’s up with the title of this program? It implies that we’ll get an hour with Andrews, but instead she’s just one of many. I don’t even think she’s the dominant participant, though we do hear a lot from her. This is really just an overview of the entire project without any particular focus on Andrews. That gripe aside, this is a fine program. It covers Music from its earliest stages through its creation and touches on most of the topics we’d like to hear. It renders the Andrews, et al., commentary nearly moot, as many of its notes pop up here. The documentary is brisk and informative. Julie Andrews and Christopher Plummer: A Reminiscence fills 19 minutes and 22 seconds. Unlike its predecessor, it lives up to its title, as it shows the actors together while they chat. Unfortunately, it proves to be much less informative. Some of the details repeat from the other components, and much of the time, Andrews and Plummer simply gush about what a great experience the film was. It’s nice to see them reunite, but we don’t learn a lot. Next we find the 22-minute and 33-second On Location with The Sound of Music. Hosted by Carr, we get a look at Austria. We find a history of Salzburg and hear a couple remarks from Vice-Governor Dr. Wilfried Haslauer. The overview talks about Mozart and the region’s music, various landmarks and movie locations, and tourist activities related to Music. We learn some of the same information elsewhere, but this gives us a decent little trip through Salzburg. More new material appears during From Liesl to Gretl: A 40th Anniversary Reunion. This 33-minute and 31-second piece presents a meeting with actors Charmian Carr, Nicholas Hammond, Heather Menzies, Angela Cartwright, Duane Chase, Debbie Turner and Kym Karath. They discuss their casting and characters, interactions with and thoughts about Julie Andrews, Christopher Plummer, mistakes they made, and many other memories. The strength of this program comes from its format. No Music fan will be able to resist seeing all of the former youngsters together again after all these decades. They interact in a warm and fun manner as they generate a lot of nice stories about their experiences. And who new little Gretl would turn out to be such a babe? For a look at the movie’s enduring popularity, we head to the 12-minute and 47-second When You Know the Notes to Sing: A Sing-Along Phenomenon. This focuses on a sing-along screening at the Hollywood Bowl and includes remarks from host Melissa Peterman, Hollywood Bowl Director of Presentations Steve Linder, Sing-A-Long Productions’ Thomas Lightburn, and plenty of annoying audience members. We see the big show and meet some special guests like the von Trapp great-grandchildren, and all the von Trapp children actors from the movie. Am I the only one who thinks this experience looks really obnoxious? Maybe I’m just a curmudgeon, but I think I’d have to kill myself if I ever was forced to attend such an event. It’s moderately interesting to see all the ruckus, though, and fans may enjoy this glimpse of this aspect of the Music phenomenon. An episode of A&E’s Biography called The Von Trapp Family: Harmony and Discord goes for 46 minutes and 29 seconds. This includes comments from von Trapp children Maria “Mitzi” von Trapp, Rosmarie Trapp, Johannes von Trapp and Eleonore Campbell, son-in-law Hugh D. Campbell, historian Reinhold Wagnleitner, publicist Alix B. Williamson, writer Russel Crouse’s widow Anna, and Rodgers and Hammerstein Organization president Ted Chapin. The program looks at the separate lives of Georg and Maria, how they met and connected, the development of the family and their musical act, their move to America and their professional career, personal topics and the way the family’s story came to Broadway and Hollywood. “Discord” gives us a fine look at the issues not seen in the movie’s take on things. We get to learn the truth about the personalities as well as various issues that happened after the end of the film’s period. It’s an involving and informative piece. A staple of Fox DVDs for older movies, a Restoration Comparison shows us the work done for this transfer. I think these pieces usually are too self-congratulatory, and I continue to feel that way based on this one. Brief but interesting, the Mia Farrow Screen Test lasts only 35 seconds. She tries out for Liesl and sings badly. Her dancing ain’t much better. Also found on the original DVD, we get five trailers and two TV Spots. The Still Galleries break into three smaller areas. We get “Storyboard Gallery” (120 frames), “Behind the Scenes Gallery” (201) and “Lobby Cards and One Sheets” (five). Although the earlier disc also presented still galleries, they definitely don’t port over intact. That platter offered almost 2400 frames of information, so this one’s collection doesn’t compete. That said, we find many good images here and this section’s worth a look. While I continue to dislike musicals, I must admit that The Sound Of Music presents a fairly satisfying piece that will definitely continue to shine for fans of the genre. The DVD itself provides strong picture and sound plus some good extras. For anyone who likes classic musicals, The Sound Of Music comes highly recommended. Important question: which Music DVD should fans pursue? 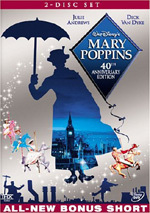 Based on the quality of the film’s presentation, I’d recommend this new 40th Anniversary DVD. However, the old release included a terrific collection of supplements, most of which don’t return here. That means Music die-hards will need to own both. For more casual fans, though, I’d advise a purchase of the 40th Anniversary disc, as it should be more than satisfying for them.